Energy saving lights (ESLs) are in greater demand because of their significant energy savings over incandescent and other regular light bulbs. You can get ESLs for both screw-in and pin fixtures. Since ESLs have an extremely long life as compared to other bulbs, you don't need to change energy saving lights very often. When ESLs do burn out, changing ESLs out is simple and takes just a few seconds. As ESLs contain mercury, handle ESLs gently so they do not break and release the mercury in the bulb. 1. Make sure that the power is switched off. Before replacing a energy saving light, you should make sure the fixture is not powered on. Do not simply use the wall switch to remove power to the fixture. You can use the fuse box to shut off power to the lamp's circuit. Use a voltage tester to verify that there is no power in the fixture. 2. Allow the ESL to cool before handling. Since ESLs use significantly less wattage to produce the same amount of light, they do not get as hot as incandescent bulbs. Nevertheless, they can occasionally burn out, rapidly generating more heat than usual. 3. Hold the energy saving light the right way like the following ticked pic. Grip the bulb gently by the ballast, not the glass part of the bulb. The ballast is the large, plastic section at the base of the bulb that houses the electronics. If you try to pull the bulb out by the glass, you risk shattering it. 4. Pull straight up gently but firmly until the bulb pops out. The pins will sometimes feel a bit stuck as you pull, so keep gentle upward pressure on the ballast while slowly wiggling it back and forth a bit to release the pins. Don't wiggle it so much that you risk snapping the pins; a very small side-to-side movement should be enough to release the ESL. 5. Insert the new bulb. Grasp the ballast firmly, line up the metal pins with the sockets on the lamp fixture, and push the ESL into place, applying gentle pressure until the pins are fully inserted. Energy saving lights used to be criticized for the flickering, bluish light they gave off . But now we can get energy saving lights that almost match incandescent bulbs for warm light and color. 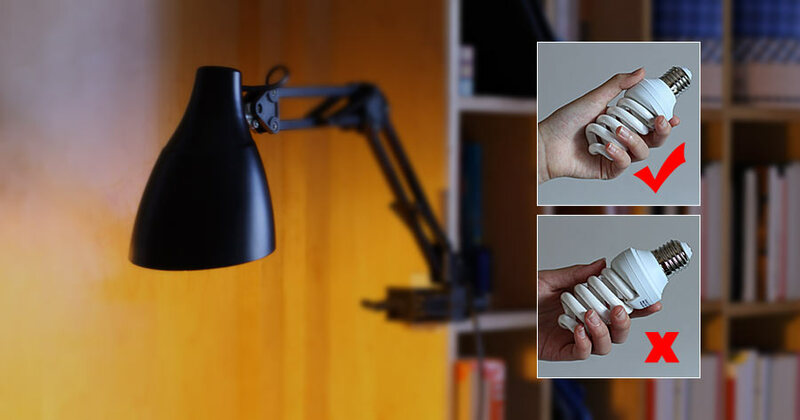 For really small fixtures, you will want mini energy saving lamps, which can be easy to find in the site. Now you can even get compact flourescent bulbs that will work in 3-way fixtures. Word of caution: never put a energy saving light in a circuit with a dimmer unless the bulb is specifically designed to be dimmable. Luminaires should not only look good and provide good light, they must also be safe. Safety is guaranteed by compliance with a variety of regulations and standards. Luminaires should meet all relevant national and international regulations. Each luminaire is insulated so that any exposed metal parts do not carry electrical current. Parts that carry current during normal operation must be protected against contact either by insulation or a suitable cover. Additional measures are taken to prevent exposed metal parts carrying current even if an insulation fault occurs. The table on the right contains the three protection classes used in Germany. Unless otherwise indicated on the rating plate, luminaires comply with protection class I.
I Luminaires with a terminal for a protective conductor to which all metal parts that could carry current in the event of a fault must be connected. Connection to a protective earth conductor absolutely essential. The symbol is displayed on the terminal. II In luminaires with this symbol there must be no exposed metal parts that could carry current in the event of a fault (total insulation or double insulation). The luminaire does not have to have a protective conductor terminal and does not have to be connected to a protective earth conductor. III Luminaires to be operated with safety extra-low voltage (SELV), i.e. voltages under 50 V generated with a safety transformer to VDE 0551 or supplied by batteries (standard or rechargeable). Luminaires must belong to a particular protection class against moisture and dust to which they are exposed. The lowest protection class is "covered"; in other words, the luminaires have no protection against moisture or dust but are covered in such a way that it is impossible to touch electric parts without using a tool. 5 Protection against harmful dust deposits. The ingress of dust is not completely prevented but the dust must not enter in such large amounts that the operation of the luminaire is impaired. Luminaires are suitable for direct mounting on normally flammable materials, in which you may not exceed 130° C (in normal operation) and 180° C (in fault case) for less than 15 min. Luminaires are suitable for direct mounting on materials that have normal or reduced flammability, in which you may not exceed 95°C (in normal operation), 130°C (in annormal operation) and 180°C (in fault case) for less than 15 min. Maximum temperature on the mounting surface: 130 °C. Luminaires are suitable for direct mounting on materials for which the flammability properties are not known, in which you may not exceed 95°C (in normal operation) and 115°C (in abnormal operation + fault case). As far as protection against water is concerned, the luminaires must comply with the types of protection indicated here. Shock-hazard protection and protection against solid parts have to be least IP 2X. Luminaires with IP X7 (e.g. IP 67) and rated voltage up to 12 V. The luminaires must be suitable for wet rooms. Luminaires with IP X4, (e.g. IP 44) and rated voltage up to 25 V. IP X5 (e.g. IP 45) is required in showers with high water pressure (e.g. ones with massage shower heads). In Germany, luminaires must comply with IP X0 (e.g. IP 20),all other European countries require IP X1 (e.g. IP 21). All other electrical equipment in this zone must comply with IP X1. Production of jewellery, retouching, etc. With the CE labelling the conformity of a product is certified with the prevailing EC guidelines, like the the low-voltage guideline 73/23/EWG or the EMV guideline 89/336/EWG. The marks licence forms the basis for the declaration of conformity by the manufacturer. Of course, all our luminaires meet the requirements of the relevant EC guidelines and therefore carry the CE label. VDE (Association of German Electrotechnical Engineers) is carrier of the independant German test and certification institute. The VDE approval mark may only be used if a product has been approved after intensive tests according to actual international and/or German standards. Approval marks comparable to VDE of other certification authorities are for example DEMKO in Denmark, FI for FIMKO in Finland, IMQ in Italy, N for NEMKO in Norway, S for SEMKO in Sweden and SEV in Switzerland. All of them are independent approbation organisations. These organisations test the safety of luminaires according to the European luminaire standard EN 60 598 under consideration of national deviations. In addition, they are also responsible for testing the electromagnetic compatibility of luminaires according to European standards. Similar to VDE, ENEC is a common European safety mark, which is recognized by all European approbation authorieties. ENEC stands for European Norms Electrical Certification. The number following the sign indicates the country of certification, i.e. 10 = VDE or 13 = SEV. The CE-mark is a certificate for authorities, for example when products crossing the border. With the CE certificate a manufacturer declares the conformity of his products with European guidelines without tests from an independent organisation. The low voltage guideline and the EMV guideline for electromagnetic compatibility. This guideline contains only general requirements, no details like the European standards.